MIT researchers demonstrate that strong churning during hot liquid state can produce stronger, more uniformly structured large aluminum casts. Industrial aluminum slabs are typically produced by blending small amounts of copper or manganese in a reservoir of molten aluminum that is rapidly cooled, a process known as direct-chill casting. Variations in the way these elements solidify can yield uneven results that weaken the final product, with castings sometimes ending on the scrap heap. 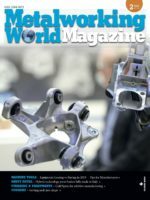 Controlling the distribution of strengthening elements to aluminum throughout a casting is thus key to reducing waste and improving product reliability. 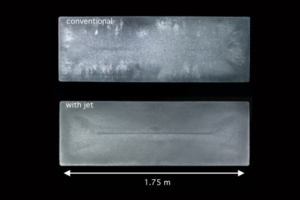 Over the past three years, MIT assistant professor of metallurgy Antoine Allanore and his student Samuel R. Wagstaff PhD ’16 developed a new process that uses a turbulent jet to reduce this uneven distribution in aluminum alloy structures by 20 percent. The researchers were able to pinpoint a single number — the “macrosegregation index” — that quantifies the difference between the ideal chemical makeup and the actual chemical makeup at specific points in the solidification process. “We have now tested the technology all along the supply chain, and we did confirm that the 20 percent improvement in macrosegregation index was good enough to allow further increase in productivity,” Allanore says.